Well apologies to all for not posting too much, work is still marching on at a pace and bucking the credit crunch keeping me busy, and despite plenty of listening, not too much writing… So it was the 40th Anniversary of the moon landings, quite rightly something we can SHOUT about as a world and be damned proud of. 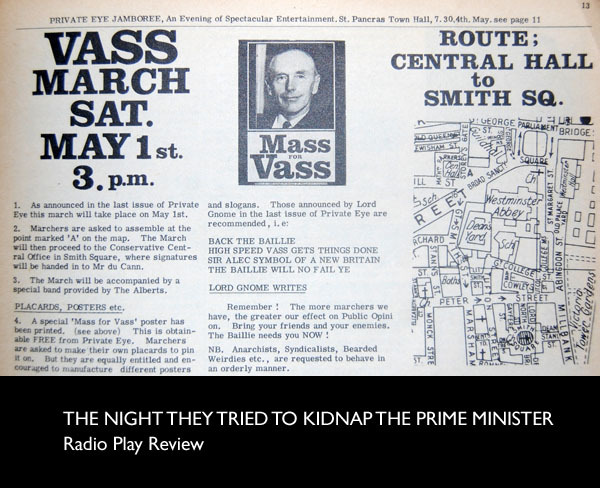 I realise I tend have have the educated reader visiting this site so lets forget the crap of conspiracy and look at how BBC radio celebrated this anniversary. There were several programmes highlighting the this great achievement and I have chosen a couple to highlight and maybe give a listen. Maybe? That hints at something I guess, whilst these programmes do not represent the best and worst of radio documentaries, they show one that hits the mark and one that just misses. 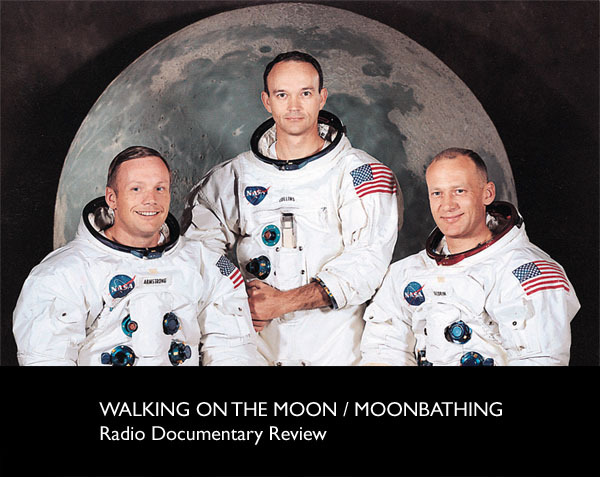 Moonbathing, a radio 2 documentary misses the mark but has a much more difficult job. Trying to equate a bunch of egotistical rockers enjoying spaced out visions with the people featured in Walking on the Moon who actually did the deed was always going to be a tricky job. The problem lies in comparing the obvious pomposity of rock and pop music with the awe inspiring job done by the Apollo team in 1969. Now with music ,one cannot be entirely impartial, one has tastes, biases and ears. What I hoped for in this documentary was something about the process behind the creativity of some great music. Music inspiring or referencing the moon landings. Gliding serenely above the rest was Brian Eno’s ‘Apollo Atmospheres’ which got a scant few minutes airtime in this documentary. A beatiful album produced by Eno and Lanois to support the film “For All Mankind” produced in 1983. It is also the only music that appears in both documentaries. The documentary was interesting, I liked the Joe Meek stuff, the obvious mention of a Seraphim, the link to sputnik, 2001 etc. What one gets is a kind of travelogue through space rock. This is OK but the link to the moon is only by association. This is just the first 5 minutes. The problem here for me is it never fell into either camp, it was neither seriously investigating the cultural (and popular) impact of sci-fi and space, nor was is highlighting some key space music moments, instead it rattled through a shopping list of space moments and music. Now all that said, give it a listen, but it is only vaguely associated to the Moon landings, instead think of journey through space music and you’ll enjoy it. It is well researched and presented but the sheer volume of material covered lessens any memorable impact it may have. Onto Walking on the Moon, how good is this documentary? Listen to the first 10 seconds and try not get hooked, the music ( for much of the programme Brian Eno’s Apollo Atmosphere’s), Buzz Aldrins incredulous opening statement, inspiring stuff. I am going to have difficulty reviewing this programme without constantly heaping praise on it, but like so many other great Radio Four documentaries these programmes are just superb. The confidence they have to let archive material and superb interviews tell the story is stunning. This should show other radio and TV documentaries that you do not need flashy technique or gimmicks to sell a historical documentary, just great interviews, confidence in the story and great editing. The use of the original BBC coverage to drive the very basic narrative of the moon landing makes the journey seamless and it links into the comms traffic of the flight and back to more interviews. You learn so much about the feelings, the pressure and the hope that existed during the build up and eventual landings on the moon. The interviews are wide enough to cover the story (the astronauts, control, wives) but still focused enough that the story and that focus is never lost (except once for me but more on that later). When Buzz Alsdrin started to talk about the technical but fascinating detail of the actual landing, you slowy realise just how big, how important and how astonishing this feat actually was. His voice drifting over the occasional music is hypnotic, his matter of fact explanation of this astonishing journey is fantastic. As we drift through interviews and comms traffic through to touchdown (via vintage BBC coverage) we get more and more tense til the final moment of the Moon landing. You get a sense of the tension at Mission Control and lastly and most importantly you get a vision of what it was like to walk on the moon, stunning material, beautifully assembled. The Gene Kranz interview is absolutely wonderful, interesting and personal. He gives a great feel of the human side of mission control. The only slight complaint I had was the vox pops of ordinary people’s recollection of the moon landing, what it mean to them, how they felt etc. These are great and very interesting, but for those few minutes we lose the granduer, the power of the story. The very normality of these interviews is great but it just jars against the stunning storytelling of the last 30 minutes. It sounds apart and different from the rest of the programme (both stylistically as well as content) and may have worked better as a footnote, but this is a minor niggle. The documentary picks up again after this ‘island’ and carries on to a great finish, and I cannot recommend this highly enough, great – great listening. Forget the visual spectacle listen to this documentary. Occasionally (very occasionally) you see, read or hear something that immediately becomes an old friend. You slip into it like a comfortable shoe, and you wonder how you have ever done without it. As you can see by my lack of posting it’s been a busy time, filming all over the UK, some big shows to prep for and we are moving into a new office. 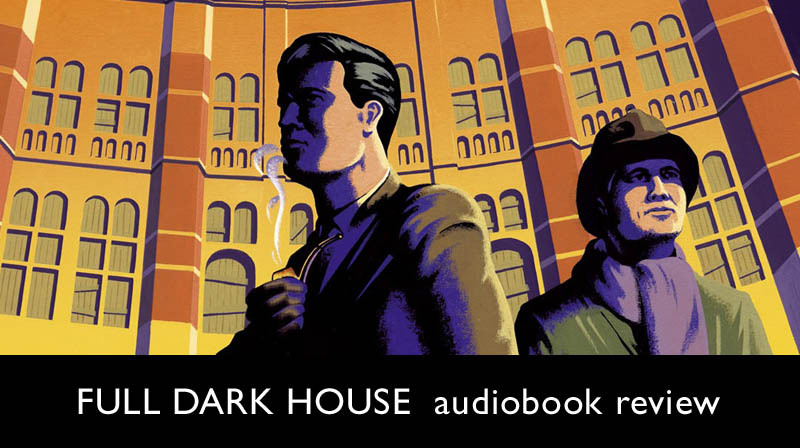 Well on my last drive I purchased (purely on spec having read a review) Full Dark House, by Chrisopher Fowler on Audio book. With this I settled down to listen to the CD’s as I drove around the UK. The book features 2 new heroes for us all to enjoy, Arthur Bryant and John May – a pair of octogenarian investigators in the Peculiar Crimes Unit. Now that in itself is enough to get one interested, but when you add in the fact that Arthur Bryant is murdered on the first page, most of the book is set in 1940 and the action all takes place in a theatre its tantalising stuff. Despite the idea of the Peculiar Crimes unit this is not the X Files. The world of Bryant and May, whether it’s the 1940’s or present day London, is real – warts and all. There is a tremendous amount of dialogue, the relationship between the two men is critical to the success of the book and they are so clearly defined, so readily accepted by you, that by half way through the book you can see them as clearly as any literary character you have ever known. The humour in the book, both in observation and dialogue is quite superb. It is a real pleasure to be listening to a book, hooked by suspense one minute and sniggering the next. The detail of both modern day and the bombed out London of 1940 is fantastic, Christopher Fowler has an idea for texture and detail which fully immerses one in his world, without getting one to bogged down by unnecessary detail. The story, building throughout to a thrilling climax, is peculiar in every regard without being ‘fantastic’. Characters are all real, but given the theatrical nature of the plot, given room for plenty of humour. It is real humour though, not manufactured and it never betrays the real dramatic centre of the book, or the tragedies behind it. It flips backwards and forwards between 1940 and the present effortlessly, both stories, dovetailing neatly to the climax. I think the decision the frame the drama (which is predominately set in 1940) was a stroke of genius. The war time story could easily stand on it’s own as the drama and characters are quite brilliant, but by linking and referencing the present day and the past, the introduction of our heroes becomes so much more effective. Knowing (and he lets us know enough, but not too much) about the events of 1940 seen from the present day, adds different complexities and dynamics to the story. What it also does is introduce Bryant and may at the very beginning of their relationship, whilst also clearly showing their present relationship. In Bryant and May, Christopher Fowler has added 2 new characters to the great tradition of detective fiction. When you try to summarise the characters, Bryant – brilliant, cranky, insensitive and bookish – May, Charming, empathic, organised, it gives a rather stereotyped impression. In reality they are so brilliantly brought to life, the have the myriad of hues that real people have, and hence are not quite so easily categorised. What they are though, is thoroughly interesting and engrossing, and of course likeable. Perhaps the biggest pleasure is to know I have heard the first book in a great series that promises many more hours with Bryant and May. The book is brilliantly read by Tim Goodman, his Bryant is simply great and he delivers the lines with obvious pleasure. I cannot recommend this highly enough, as either audio book or paperback – so dive in you will not regret it! PS. Just stared reading The Water Room and thoroughly enjoying it. Grassy Knolls, second shooters, patsies, conspiracies galore…the 22nd November 1963 was probably the most infamous day in American History til 9/11. They were both tragic days where violence attacked democracy, they were also days that have sadly developed a wealth of conspiricy theories. I have nothing against a good conspiracy theory (after all how did Bruce Forsyth get on Strictly Come Dancing if it wasn’t for some Masonic entertainment organization) but sometimes they get in the way of truth, memory and indeed celebration (in the case of the ridiculous Moon landing conspiracies which try to darken the work of some brilliant and brave men). JFK has become canonized since his untimely death, and whilst he was far from an angel, his charisma and acute political ability made his a popular figure, more so since his death. Arguably the Kennedy Whitehouse used more wiretaps and buggings than the Nixon presidency, but as history looks back I am not sure I can imagine JFK having quite the same squalid conversations as Nixon had with Dean, Erlichman and Haldeman. JFK’s ability to ‘get away with it’ was one of Nixon’s main bugbears, but watching and listening to JFK speak one can see why he made such an impact. He had looks , charisma, confidence and great oratory. Maybe people just wanted to believe this was the real thing that was going to make everything better. Don’t forget that this is the early 60’s and the world had spent the last 15 years or so recovering from a terrible war. The youth of the day was beginning to have it’s own identity, and for a while there was hope of a new future for the world and JFK was of course part of that. The 6 day war, Bader Meinhof, the Angry Brigade and Vietnam had yet to break the love generation ,so maybe people had the right to be hopeful. Radio 4 did a great series of programmes on JFK and his importance and this was perhaps my favourite, much against my preconceptions. Trying to report what happened on that day is not easy. It’s not just that some of the facts are a little vague, and contradictory it’s mainly the fact we are all ingrained to believe there was a conspiracy. What Alan Thompson does in this excellent documentary is try to get to get across the story of the day without hyperbole, without opinion – and it is all the more powerful for that. He let’s the interviews run and often ramble, from the policeman, newspapermen and the only living member of the Kennedy car Nellie Connolly. Her interview is very upsetting, all the more for the way in which she tells it, a lady clearly still affected by what she saw in those 6 seconds. There are no experts to tell us what may have happened, no second hand stories of shady dealings, no pomposity from a US historian, just very ordinary people in an extraordinary time. The extraordinary story is followed through to the end as Jack Ruby shoots Lee Harvey Oswald. It is astonishing to think that Oswald was initially arrested for the callous murder of Officer Tibbet before the station put two and two together and realized here was not just a cop killer. The murder of Oswald by Ruby is more like a farce than a murder and the various interviews very clearly show what kind of man Ruby was and also how simply he was able to get in a position to shoot Oswald. It also shows how different the day could have been, if we agree that Oswald fired the 3 shots, his $8 sight performed well, but also he was undoubtedly lucky to get that second shot on Kennedy, Ruby was very lucky to get a lethal shot Oswald. A few bullets, a few inches difference and a very different day. If you want scandal and revelation, conspiracy and surprise, then don’t listen to this. If you want an honest attempt to simply present the day as several different people believe it happened then this is fascinating listening. At the end of this I am not sure you can doubt the testimony of the eye witnesses, whilst you may doubt whether Oswald worked alone. But ultimately all the politics and mafia rumours which may or may not have influenced Oswald’s assassination attempt and subsequent murder by Ruby fade when we hears the extraordinary events of those three days. A compulsive and slightly unsettling programme that answered no questions, but wisely never promised to. I defy anyone not to feel emotion when you hear Nellie Connoly speak or the KLIF radio reporting ‘Something is terribly wrong’. I had a slight feeling of despair at hearing the events unfold like some Greek tragedy, so many things that may have happened differently and changed history for all of us. Why you shouldn’t question the moon landings. One of the first things I hunted for when I discovered radioarchive was R. D. Wingfield’s Outbreak of Fear. Nosing around the internet it was always mentioned as a great radio drama and gets passing mention in the biography of the famous crumpled detective Jack Frost. I have to admit I never got on with TV’s Frost. Nothing against it, it just never clicked with me. A shame, because if it had, I may have sought out the radio versions sooner. So when I listened to ‘Outbreak of Fear’ I had no preconceptions, no knowledge of Wingfield’s style. What I had was a tremendously good time. What strikes one immediately is the great characters Wingfield creates. At the centre of it is a faultless performance by Leslie Sands as Sergeant Fowler. Down to earth, gruff, sarcastic, realistic, so many things that make him human. Don’t get me wrong this is not a small inward performance, this is a real character actor at his very best, but it is perfect. I understand that Leslie Sands was a favourite of Wingfield (he played Frost’s on his first radio outing) and I can see why, Wingfield’s words and Sand’s performance are perfect partners. Things are not going well in Polford (near Denton), though of course that’s not it’s real name… A man tore his own eye out to run away from an unamed fear, people butchered and bludgeoned to death. Sounds grim? Well it is, but it’s also very funny (thanks to the great character interactions) and suitably fantastic by the end. The new boy, Constable Roy Beaumont (very nicely played by Nick Orchard) offers us a narrative of thoughts, as well as the occasional chilling comment on what we are about to find out. He finds a rural police station run by Seargant Fowler, assisted by Constable Dave Clark (Cornelius Garrett) a bit of a lad and a ladies man. They are busy dealing with wandering sheep, the odd domestic dispute and generally trying to have an easy life. Over the course of a few days, people are murdered, the area is cut of due to a rabies outbreak, hardened criminals escape from a prison and Superintendant Chadwick (Nicholas Courtney) turns up from U.N.I.T (sorry couldn’t resist it), turns up from the County Constabulary to take charge of the investigation. There are red herrings, cliff hangers, twists and turns before we reach the end of this real rollercoaster thriller. What strikes one is how Wingfield manages to mix comedy and horror without having to use black comedy, it just emerges from the natural relationships of the characters. There are real laugh out loud moments here, and moments of real terror but the two never jar, never clash clumsily, just sit side by side as in real life. Having now listened to most of R D Wingfield’s radio plays I would hesitate to call it his best, he has written so many very good drama’s I wouldn’t like to choose. But it’s tempo and increasingly outlandish plot make it different to a lot of his work where the plots are more mundane. The dialogue is just brilliant and combined with an excellent cast it’s hard to go criticise really. The pace may slacken a bit at the end, but any finale to a drama with a tempo like this was bound to disappoint just a little. Nothing wrong with the ending, you simply wish you could spend another few days in Pulford. Anyone who hasn’t heard this should really download it and maybe it will start you on a discovery of the brillaint work of R. D. Wingfield, whose string of radio plays, without exception, are an unalloyed pleasure. As someone who listens to so much radio one can’t help be tempted by that most inward looking of documentaries, one about BBC Radio. Billed as 6 selected years in radio history (thanks again BBC7 for the attractive programme description) I naturally expected something like Russell Davies enjoyable series on Radio Comedy. Some choice sound bites from the archive with some informative and lightly sarcastic comments scattered throughout. Nothing wrong with that. But, as it happens, nothing like this programme. In one episode (1956 I think) there is reference to the avant garde musique concrete. This series of programmes is perhaps Radio Concrete. There is no explicit narrative, no mocking of 1940’s bbc voices, no reflections on Great Britain as it was in the years highlighted. To put it simply; no scripted and presented narrative / commentary. What we have (using the idea of a radio tuning in for a transition) is a collage of the listening of a year, the news, discussions, music and entertainment. 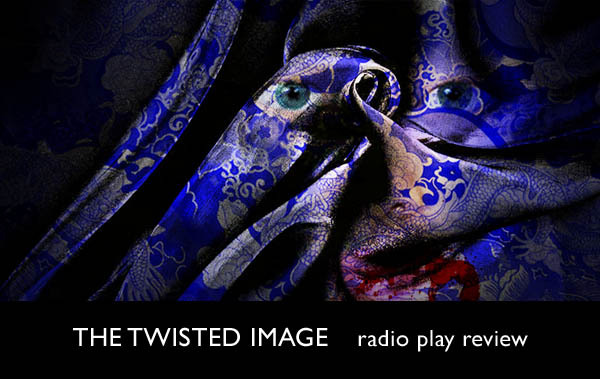 You will not hear extended clips from ITMA or the Goon show (though they both appear) but rather they are woven into the rhythm of this extraordinary series of shows. At first the lack of direction (by that I mean the direction in which we are naturally pointed by a narrator or presenter) is somewhat disconcerting, but after 10 minutes listening it was liberating. There are obviously editorial decisions made, someone chose what and in what order to play the items, this is no random selection of clips – far from it. Listening to these programmes is a much more interactive process. Without the aid of a narrator annotating everything you hear, you have to think a little more about why you are listening to a certain clip, and where it sits in that particular year. There is commentary (of a sort) in the reading of BBC internal yearbooks and listener’s letters. It is an unobtrusive way of pointing you in the right direction as to what programme you are listening to and what changes were going on in society at the time. But what makes them so much more than merely a comment on that particular year by a presenter is that the words are contemporary to the programmes. We can learn as much from 1947’s comments about 1947 as we can from the programmes themselves. There are laugh out loud moments, moments of sadness and moments that just confound. The lady from the 62 show (I think) commenting that at least the Nazi’s didn’t have pop music (this was a positive thing to her) was priceless as was the nationwide like staging of Brain Johnson hiding in a post box to discuss Christmas early posting through the letter box with the general public. Unfortunately as I listened to the whole series today in between two shoots at different ends of the M1 I cannot accurately annotate or highlight each episode. But what came across most clearly is the painstaking work that went into assembling these programmes which seem pin sharp due to their lack of presenter. You do get a real sense of the UK in the forties, fifties and sixties and the developing tensions between the establishment and the increasingly vocal public. They could have made the editing obvious and clumsy but it never seemed that. The programme is happy for us to take what we want from the year with just a gentle guiding had to show us where radio was heading. The contrasting of Eve of Destruction (Barry McGuire?) with the panel discussion on the important issue of the day (keeping Britain’s hedgerows) was more affectionate than cutting and kept the tone just right. The simple highlighting of racism in the early years was short but devastating. Other links between elements were wordplay or more abstract, but carried you along wondering just what you will hear next. To detail all the gems scattered through these programmes would take forever and probably ruin the fun that you will doubtless get in every episode. This has probably been one of the best programmes I have listened to for a very long time. The bravery of the format should be applauded, the excellence of delivery celebrated. I think it dates from around 1992, and I could find no real details on it, but I hope the production team got the credit they deserved for this brilliant series. Having just run Rogue Male, BBC7 ran an abridged version of Rogue Justice this week. I (along with generations of others) thoroughly enjoyed the story of the ‘Rogue Male’ and was looking forward to the adaptation of the sequel. Unfortunately it offered very little in comparison to it’s forebear. Perhaps the best example I can give of this, is when it finished today, I was expecting another 10 episodes. So flat was the ending it merely felt like the end of a chapter. I think the easiest way to explain why Rogue Justice fails is simply to compare it to Rogue Male. Rogue male was an intimate battle between our un-named hero and Major Quive-Smith (a German agent, never stated but implied). The hunter and hunted and a certain symmetry of character make this battle engrossing. There is tremendous suspense in the original story, and the narrative and the locations are simple and clear. The drive is the hero’s obsessions and character. The impression given in the book is that the death of his lover was more a catalyst that lead him to become a lone hunter, the personality, the character traits were already there, this is no lame Deus Ex Machina, more a revelation to the character. His symbiotic relationship with nature is a pleasure to read, and a real generator of suspense. There are no protagonists in Rogue Justice worthy of a mention, just a few nasty Nazi’s (yes it is explicitly Germany this time) . He never pits his wits against the elements let alone someone comparable to Quive-Smith. His lover becomes the overwhelming driver for his revenge on a state, her torture almost out of Sax Rohmer. The feel is more of an extended travelogue with an occasional fight with ‘the Germans’, a Jewish character is introduced and you feel he may become an outlet for discussions with our hero, but he is just sidelined halfway through. I guess the main criticism is that it feels like a different character in a different kind of novel, but most importantly, and more simply, there is no suspense and no resolution. Listenable, absolutely, it passes the time, but once you have heard the original, decidedly ersatz. British weather, love it or hate it, we all talk about it. When I say talk, I mean mutter- we hardly boast. Watching the discovery channel one can’t help wondering what it must be like to have hurricanes, tornados, monsoons and avalanches filling up your back garden on a Sunday morning. It would, of course, be terrible, especially for your seedlings. So we have the BBC radio answer to extreme weather – Strange Weather Days. Note the title, not ‘When rain goes bad’ or ‘The worlds worst hurricanes.. EVER!! Strange weather days. Truth is, it is a pretty accurate title. There are no dramatisations’, no OTT interviews, no dubious experts, just ordinary honest people telling some fascinating stories. From the moment the music (Brain Eno?) kicks in you know enter a special world of slightly strange weather. The programme is aware that it is dealing with weather which is hardly worth a footnote in the world stage, yet what makes it so fascinating is the people and the settings. These are genuinely nice, normal people who have witnessed things we, most likely, never will. Helen Young is the perfect presenter. Obviously interested in the stories she is hearing, both as a meteorologist as well as sympathetic (and obviously likeable) listener. Some stories are quite whimsical, the hottest day ever and the huge hail storm have no real tragedy in them, others dealing with smog, blizzard and lightning at times are more serious. The only story I found slightly less effective was the London smog episode, given the number of people who died it was perhaps not the right format to deal with the story. This is the only minor criticism of a very listenable series. So after all I said about extreme weather do I still want tornados in my back garden? Give me strange weather days any time. Whilst one might gasp at the sight of a tornado streaking across Wichita (there is after all no spectacle like nature) one cannot help but be enthralled by these very ordinary British tales. They are told with subtlety and wit, something sadly missing from most ‘weather’ documentaries. The researchers and editors did a wonderful job finding these people, no one is mocked or frowned upon yet there is always a hint of the eccentric in many of the people they interview. All the interviewees tell fascinating tales of the strange days, in words we can all understand, with not a note a hyperbole in sight.